More Information on omega fatty acids. “So I see that your eggs are produced from grass fed chickens. Does that mean they are omega 3 eggs?” The farmer at our local market’s quizzical look edged with annoyance told me he did not concern himself with the omega content. “Sure they’re grass fed but we supplement with high quality feed or they’d never lay enough eggs.” I pointed to the carton,”Look, it says they are.” He shook his head and glanced at the folks lined up behind me who were anxious to buy more than just a half dozen eggs. “I don’t know anything about the omega. We reuse other folks’ cartons.” I took my half dozen and hoped for the best. What the farmer at our market had not cared to realize is that the omega 3 content in eggs and meat is two to five times higher if the animal is grass fed, and in better balance with the omega 6 content. Corn and soy meal feed can throw off the beneficial balance of omega 3 and 6 which should be about one-to-one or one-to-two. It is one of the many reasons why some doctors and dietitians recommend omega 3 eggs and grass-fed animal products. Our diets are high in the inflammatory omega 6 fatty acid but it is not totally due to eating conventional (corn and soy meal fed) meat, chicken, and eggs. The imbalance also comes from other saturated fats and processed oils. Switching from saturated fats like butter and cream to unsaturated ones like olive oil and nut creams is the first step in a healthy diet. There are many oils to choose from: soybean, cottonseed, corn, vegetable (usually a mix of these three), olive, and flax seed oil, just to mention of few. 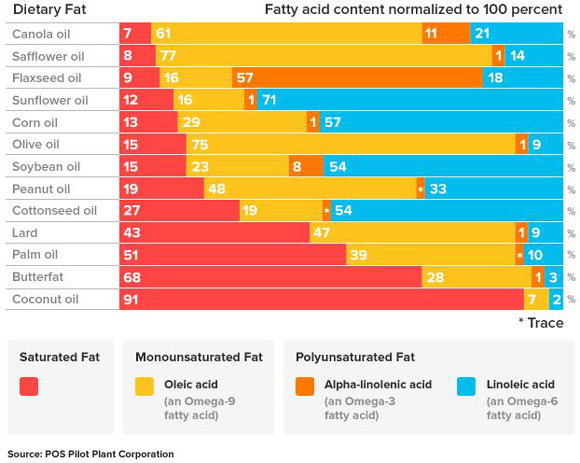 Each of these polyunsaturated oils contain omega 3 and 6 fatty acids which are necessary for our overall health, but not all oils are equally beneficial. Vegetable oil, corn oil, cottonseed oil, and soybean oil are all poor choices since they are too high in omega 6 fatty acids. These processed oils are also used in most processed foods because they are so cheap. Consuming high amounts of omega 6 by cooking with these oils and by eating processed foods, can produce inflammation in the body and contribute to all sorts of illnesses: heart disease, diabetes, arthritis, Alzheimer’s, and various cancers. Instead, use oil that is low in omega 6 like canola oil. Canola oil is good for cooking because it can withstand medium-high cooking temperatures. Flax seed (very high in omega 3) and olive oil are good choices for recipes that do not call for cooking, for example, most salad dressings. In addition, eat foods high in omega 3 like fatty fish (salmon, sardines, anchovies, and caviar), nuts and seeds, and leafy green vegetables, to improve the body’s overall intake of omega 3 fatty acids which are anti-inflammatory. Omega is the last letter in the Greek alphabet and is now used to mean “the last in a series.” God used it in a pairing with the first letter of the Greek alphabet, the Alpha. He said, “I am the Alpha and the Omega.” He said it three different times in Revelations. The first is his proclamation that he is who he is, was, and will be. The second is that he is the beginning and the end, and then Jesus finally says that he is the first and the last. Between the alpha and the omega are all the other letters that in various combinations form the finite words of scripture about God. People from every age have spent quite a deal of time contemplating these words and trying to illuminate and understand the true God. Jesus is determined by St. John to have embodied the very word of God. His actions here on earth, the words he said, the stories he told, and the incredible miracles he did have been recorded and meditated upon for incalculable amounts of time by those trying to discern who God is and what He wants from us. Who can count the number of books written about scripture, either to teach, preach, or encourage? Despite the small amount of scripture that we do have, we have certainly gotten a lot out of it. However, God’s most important message is fully revealed in the life of Jesus Christ and the scripture we do have about him is sufficient to bring anyone to faith. Jesus is the extraordinary work of the Alpha and the Omega. Nothing is known of God that he has not chosen to make known through the life, death, and resurrection of Jesus Christ. He is the first and last expert on himself and on us, his creatures who live humbly in grace thanks be to Jesus Christ and who live for his everlasting glory.